Searching for an appropriate story to supplement the day's lesson plan? Attempting to teach children how to do "The Chicken Dance?" You'll find the answers here, as best-selling authors Pam Schiller and Jackie Silberg team up to bring you the ultimate resource! 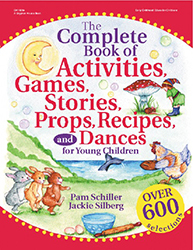 Bursting with new selections and old favorites, each of the 600 activities, stories, games, recipes, props, and dances will enhance any preschool curriculum. Companion to The Complete Book of Rhymes, Songs, Poems, Fingerplays, and Chants, it is an essential addition to every classroom!